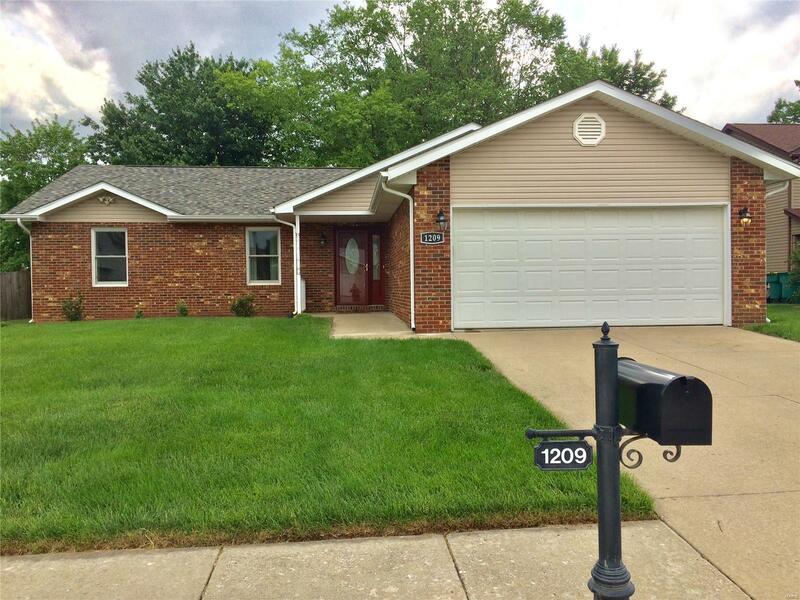 Delightful one story in a cul de sac in the heart of O'Fallon. Offers three bedrooms and two full baths, vaulted great room/living room combo, open kitchen with plant ledges, laundry room, and a delightful sun room. Picture window and sun room offer a view of the backyard with three mature trees offering shade in the summer and colorful foliage in the fall. The great room features a gas fireplace framed by a window and glass door to the sun room. The open floor plan is perfect for large gatherings. The kitchen and dining area are adjacent to each other; convenient set up for visiting with the chef while preparing meals in the kitchen. Master bedroom suite offers a walk in closet, two large windows to see the outdoors, en suite garden tub, separate shower, and double vanities. Two extra bedrooms for visiting family and guests. Fully fenced. Andersen windows throughout installed in December 2016, vinyl siding in 2012, roof in 2011, A/C and furnace in 2015. Already passed city inspection.